Making a loving, positive difference in the life of the children in foster care. Providing clothing and other necessities to children in foster care in our community. ​https://www.facebook.com/fostercareclosetalexandria/ and click the signup button on our Facebook page! 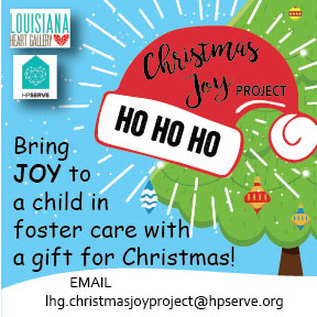 The Foster Care Closet is a collaborative project with Louisiana Heart Gallery, CAN, New Life International Outreach & First United Methodist Church of Alexandria. It is located inside of First United Methodist Church of Alexandria. The Hygiene Closet is located at the Rapides Parish DCFS in Alexandria and is stocked with everything a child would need for their first night in a new foster placement. This gives caseworkers the ability to clean and dress children before bringing them into a placement. This event is for anyone and everyone. We will have information on how you can volunteer and serve the local foster/adoptive community, along with information on how to start the process if you are seeking to become a foster or adoptive parent. There will be a special panel of guests to answer any questions including: DCFS social worker, CASA volunteer representative, current foster parents, and adoptive parents (fostercare adoption, private domestic adoption and international adoption). We will have an anonymous text system set up so that you can text in your questions LIVE to the panel on stage.